For your convenience, we've placed only a few images on each page of this gallery. When you are ready, go back to page 1 or page 2 in this Gallery, or use the tags at the top to view other galleries on our site and place your order. 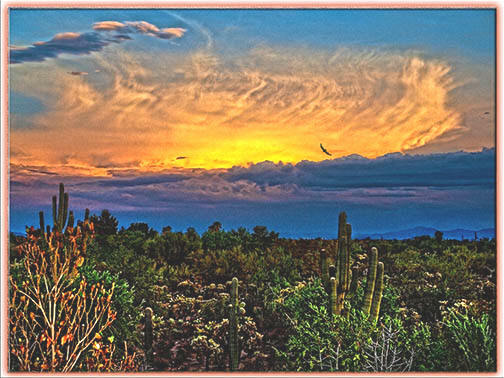 Summer Monsoon© provides an amazing scene of earth, water and fire. Here the lowering sun streaks across the monsoon air in alternating patches of bright, red, and dark sky. 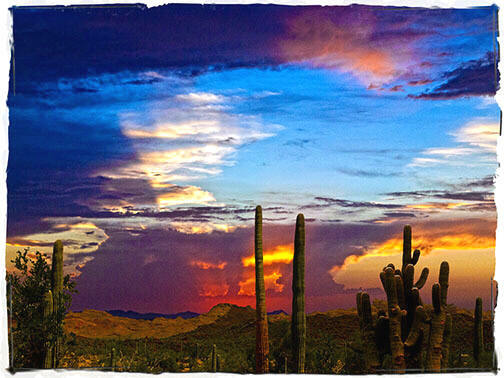 The tall saguaros are dimly lit against the hills beyond as they thirstily await a drenching rain. Can you feel their excitement? Sunburst©. The sun has already set somewhere out of this picture. But after sinking below the visible horizon, it catches a layer of high stratospheric clouds well above the low cumulous that has already gone dark. The result is a miraculous sunburst lighting the desert below. Tucson’s Catalina Mountains are just visible on the right edge. Sunset Landing©. The sky is still glowing with this pink and purple pastel sunset. Look around and see what is happening in another direction. Watch as a great horned owl lowers silently from the sky. In the twilight we can’t see the target, but she is clearly coming in for a surprise landing. Through the Canyon©. There is only a trickle of water now, but there are times during the monsoon season, that this rocky slope becomes a great waterfall into the Santa Rita’s Box Canyon below. Check the evening clouds, Will this be a wet night? 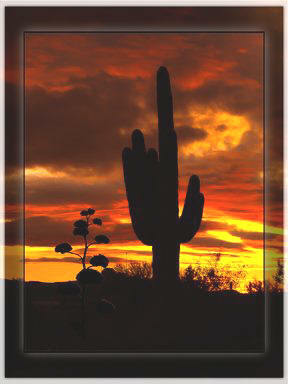 Window of Light© is a fiery Sonoran Desert sunset. The sky is cloudy, but it is lit brilliantly in this early evening. 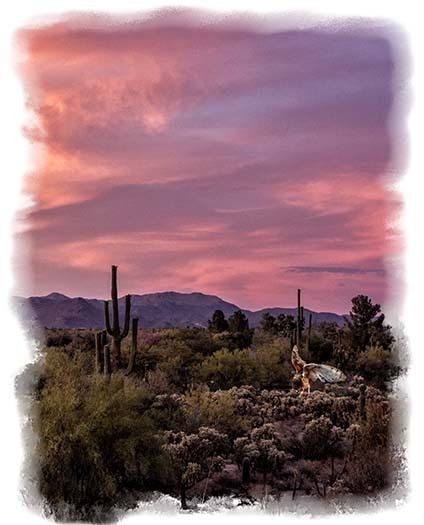 The giant saguaro and flowering agave stand bravely against the gathering night.